The phantasmagoria of Valentine Penrose 's images and poems, by the clever and marvel of her writing, by the naive objectivity of her collages, make me gain confidence in myself and in the virtues of truth given. In these words Paul Eluard evokes the work of Valentine Penrose (1898-1978) in Dons des Féminines, from which he wrote the preface. 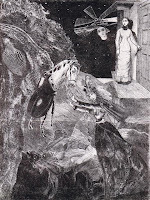 The poetess and surrealist collagist had multiple lives : in England with her husband, the photographer Roland Penrose, in Spain, where she mes a guru, in India where she went to live in an ashram with the painter Alice Rahon Paalen, in Algeria where she wassent in 1944 after enlisting as 3rd class soldier. Woman of character with a beauty appreciated by the surrealists, Valentine Penrose celebrates womanish, sometimes flirting with racy eroticism. Penrose (Valentine). Dons des féminines. Préface de Paul Éluard. Paris, Les Pas Perdus, 1951, in-4, covers. 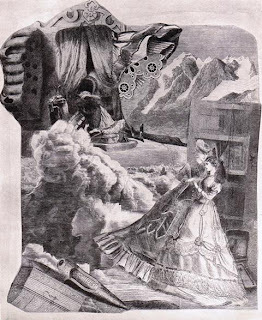 Édition illustrated with 25 full page collages by Valentine Penrose. Limited to 400 numbered copies. Preface by Paul Éluard. Any use of the elements of this site for a commercial purpose is prohibited. For a publication of the contents, please contact the web designer.